It is the first I have heard of this event but it seems that this has been an annual thing for 12 years now. The Pasinaya is a celebration of arts and culture that showcases over 150 performances being done simultaneously over the Cultural Center of the Philippines. The Pasinaya was exactly what I expected it to be. It was an explosion of color, immersion in culture, and appreciation of the arts. We saw the Dinagyang dancers, Ramon Busco's Troupe, and a Harvest Ritual. We didn't have time to go around but what we saw has left me wanting. 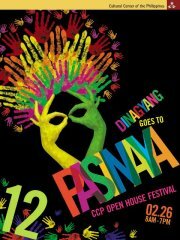 Now, I can't wait to attend the Pasinaya 2013. Hope I can attend this next year.. :D It seems so fun!